I found it incredibly difficult to find any reliable information at all on this topic before heading for Venezuela. So, hopefully, this post will go some way in enlightening those that are frustrated and confused by the lack of reliable information out there. First of all, don’t be put off by the guide books that caution against exchanging money on the black market because it is illegal. This is a foolish position to take as, if you accept the official exchange rates, you will find that prices in Venezuela exceed those found in London or Manhattan. Exchanging money on the black market is incredibly commonplace and is an activity commonly engaged in by government employees themselves. 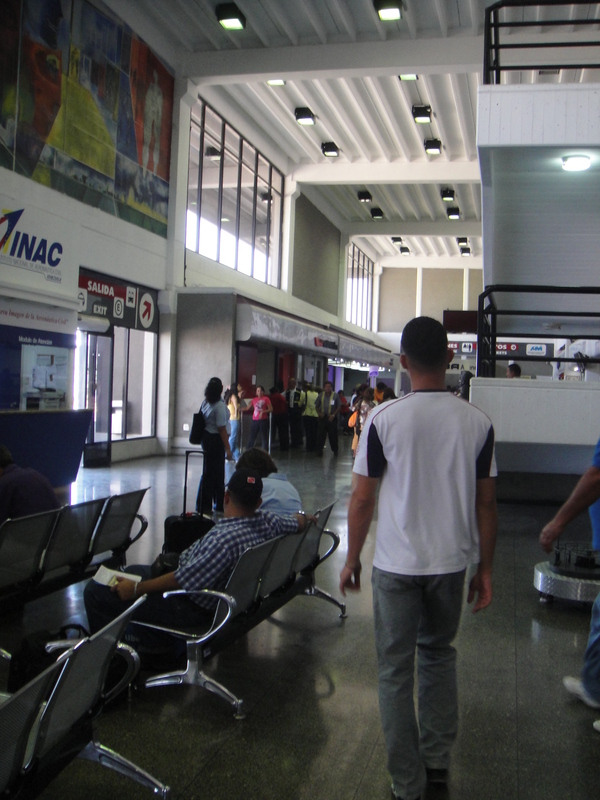 Secondly, upon arriving in Venezuela from an international destination, do NOT exchange your money at the airport. A variety of sharks will immediately begin to swirl around after you have passed through Immigration & Customs – just ignore them and whatever they might be offering and head straight outside to catch a taxi. Unfortunately, I was suckered in by a charming Venezuelan government employee – “Just call me Johnny” – at the Caracas airport that, to make a long story short, did a splendid con job. I ended up exchanging 500 euros with him at a rate of four Venezuelan bolivars for one euro. This was a horrendous rate and it should have been seven bolivars per euro, so the first part of our trip was pretty expensive (It was 7 to 1 when we were there, but just after we left, the bolivar was devalued, thus the new rate should be far superior). The mistake I made was to check the black market exchange rates on the internet before we left and to discover that the going rate was four bolivars per U.S. dollar. So, I had the 4 to 1 ratio stuck in my head. Jet-lagged, exhausted and in the hands of a brilliant conman, I accepted the 4 to 1 ration for euros and only realized my mistake after it was too late. Don’t be a fool like I was, and avoid any service offered at the airport – even something as seemingly innocent as assistance with hailing a taxi will end up with you getting ripped off. Do everything yourself. The operators at the airport are professional sharks and will lock on to you when you are at your most vulnerable. These operators include government employees as well. In fact, they are the worst and so don’t think you can trust someone just because they are wearing a government uniform. Your taxi driver will be delighted to accept your euros or your dollars – as will your hotel and anyone else you encounter – so don’t feel the need to exchange money right away. When you are ready to exchange your euros or dollars into Venezuelan bolivars, just ask the clerk at the front desk of your hotel. They will quote you the “official black market rate” and can handle even relatively large sums. I was rather amused by the phrase – official black market rate – the first time I heard it, but that is the phraseology they use. If you are suspicious of the rates quoted to you by your hotel, check with another hotel and see what their rates are, but the hotels are generally trustworthy in providing the official black market rate. I sincerely hope this helps someone. Tags: black market money exchange, Black Market Money Exchange Venezuela, exchanging currency in Venezuela, Justin Ames, Venezuela. Bookmark the permalink. Thanks for this useful advice – there’s so much contradiction around, but this seems like the best process. Did you take all the dollars you needed with you? You’re welcome, Beth. I hope it serves you well because we had to learn the hard way. We had plenty of dollars actually. Once you get the proper Venezuelan exchange rate (the black market rate), everything becomes quite affordable and reasonable. I found this post is VERY helpful. I am planning a trip to Venezuela this coming January and am looking for advice. One question I have is: Did you arrive with tons of euros/dollars in your pocket? How do you get dollars/euros into the country to exchange them without carrying a wad of cash on you? Yes, I did arrive in Venezuela with a pocket full of dollars. There just isn’t really any way around it because you need cash. Unless it is an emergency, do not use an ATM to get bolivars because you will pay the official exchange rate which is terrible. The same holds with using a credit card to buy something in Venezuela. So, I would suggest arriving with some dollars in your pocket to get to your hotel (Yes, the taxi driver will take dollars) and then keeping the rest in a money belt or the equivalent until you exchange them. Thanks a lot Justin for your quick reply. I think the problem for me is that I will be going for three months. That is ALOT of cash to carry around. Did you travel for an extended period? Were you carrying thousands of dollars around? Any ideas on how to do this safely if I am staying for a long time? That is a lot of cash, but I really can’t think of a better alternative in Venezuela. We went for a month and had a couple of thousand dollars with us (which was more than we needed). So, I can understand your concern. If it makes you feel better, we never had any issues with pickpockets or any other sort of street crime and we spent a fair amount of time in what are supposed to be some of the worst neighborhoods of Caracas. So, in short, I would say bring the cash. Keep some in your pocket for your daily needs and stuff the rest in your underwear or a money belt. I’m about to go to Venezuela next month and had no idea it was a massive hassle to get decent exchange rates. I have also heard that its a real pain to pay with credit cards in the country, but that doesnt worry me so much. When you get out of the airport, is their a town or a shopping area nearby which can be walked to, in order to not get ripped off by these conartists? I have often bypassed all the fonies at airports and found decent places nearby (provided that they were safe to get to). Thank you for your comment. I’m glad you found the information helpful. Yes, do NOT pay with credit cards in Venezuela. They will work, but you will pay the official exchange rate in Venezuela which is set at an absurdly high rate. What this means is that you’ll be paying New York or London prices in Caracas or wherever you end up. And you don’t want to do that. I am assuming that you are flying into the airport at Caracas. And in that case, no, the airport is away from the city and there is essentially nothing around there. Bring a bunch of dollars and euros with you and you can pay for your taxi fare from the airport with some of this money as the driver will accept foreign currency. You may get ripped off a little by the taxi driver, but there isn’t much that can be done about this initial ride (and it is still much better than being brutally ripped off by the sharks at the airport). Then, once you are in your hotel, ask about exchanging the rest of your dollars or euros there. They will either do it themselves or know someone that will. How hard is it to sell back the Bolivars for dollars at the official rate, when you are ready to leave? I’ve heard that it’s not easy or that the rate is not very good. Can a tourist go to the banks when they are ready to leave and sell the bolivars? You’ll have an incredibly tough time with that. Neither the banks or individuals will be interested in giving up/trading a “good” currency for bolivars despite what the official policy is. I mean, obviously, you will eventually find someone willing to make the trade if you offer a good enough price, but it will not be a good exchange for you. If you can, try to budget carefully so that you leave Venezuela with just a few bolivars left that you can keep as souvenirs. One thing to keep in mind for longer term travel. Nearly all of the larger money changers, hotels, retail, etc have a US bank account, You can transfer money to their account in the US, then pick up the Bs when the exchange is made.